Closing the Conference this afternoon, Bilal Malkawi thanked participants for a wonderful democratic conference and congratulated the young workers' committee for collecting USD714 from members for the Palestine Solidarity Fund "you have broken barriers again!" he said. "Your conference has been active, exciting, clever. This is a changing part of the world, and we will continue to stand with you and defend you. Your regional team is fantastic, we acknowledge them. We are looking at the future we will keep taking up the fight and delivering. You are tackling railway privatisation, you have made plans for workers with no voice in aviation and you have a work programme for Palestine. "You have tackled freedom of association and human rights. you have taken every opportunity and faced difficult issues, and you have come out strengthened and united determined to be ITF Arab World and to have a loud voice in our global organisation. Next time we see you will be at our Congress in Sofia, Bulgaria, in August next year, when I am sure you will bring your determination, personality and vitality to the rest to of the world. You empower us to do a better job and we will be here for you." 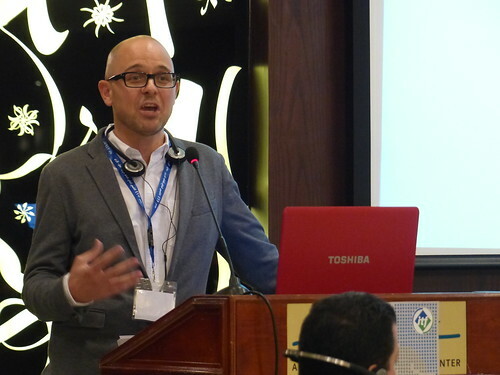 The ITF's David Hansen Miller explained to participants that the ITF was working with other global union federations including IndustriALL to pool resources and industrial strength across the transport chain. The idea that ITF unions could grow in industrial strength by working together with oil and gas unions was behind this project. "We want to link up the various unions that have a role - from pipelines to ocean tankers, fuel tankers, oil trains, and jet fuel distribution," he said. Oil companies are increasingly working together, he continued. The distribution map was also changing. China was now the world largest importer of oil and gas on the planet and companies in the west were set to decrease their consumption as energy renewables grew. Companies could see this coming, said Miller - and wanted to diversify. They were looking for ways to move into different markets and were going to try all their tricks. The project looked at sharing and building capacity; "unions are not always equipped for companies moving in," he said. "Unions can transfer skills across the supply chain, we can work together and have potential. We are aiming to build international and industrial solidarity." Participants asked questions about the independence of unions and about the potential to impact the aviation industry; several questions were asked about the information and training that could be available. Some participants asked about the potential to organise new unions in the private sector. Miller explained that in other regions such help had been given - for example, a project involving seafarers was working with Kenyan government to carry out capacity building and design state policy. Adjabi Lazhari from the Algerian port workers' federation gave an example of the strong strategic alliance in his country. He assured the meetings that good coordination existed with oil unions in Algeria. Transport workers could support oil workers create issues for export "a one-day strike we had upset the oil terminal and all the bosses were were calling each other. We can do this and give each other more support." Concluding the session Bilal Malkawi said that this was a worldwide project - it was a big job, with work starting from scratch in many locations, but that discussions had already started with ITF unions in the Arab World. "We need conferences and workshops," he said, "but we will work on it and build strength together." Bilal Malkawi introduces a session on GNT unions and regional standards for dockworkers. Sharon James, ITF dockers secretary explains that Global Network Terminal operators (GNTs) dominate the port industry. Their strength can be demonstrated by APMT which has 60 terminals around the world. "It important for port workers to set standards and be organised. We must be clear, 80% of large terminals are run by private companies which need to be watched as growth is expected at the expense of state-owned and private ports." She continues "This region has had successes in Aqaba port, Bahrain which is close to an agreement, as well as Tangiers and Egypt. These unions are organising and mobilising for rights." James introduces 'Steps on the Road' an ITF Arab world film looks at dockers organising efforts in APMT. A lively session was headed up by Bob Crow of RMT Great Britain, the proposer of the ITF's resolution on Palestine to the ITF's 2010 Mexico City Congress, see Resolution 21 here >> Introducing Bob, Bilal Malkawi said he was "a big defender of workers' rights in Britain and an important advocate of the Palestinian cause"
Opening the debate, AGS Stuart Howard explained the ITF been giving practical assistance to comrades in Palestine in a three-year project to support truck rest stops. The basic needs were to re-start the union in Gaza, which had been mostly destroyed, and to organise more workers, as well as to establish a full work programme with its own budget to fund work in West Bank and Gaza. An ITF Executive Board mission was planned in February 2014, which would also include Arab World participants. Crow told the participants that his union wanted not to interfere but to support the Palestinian cause as trade unionists first. "All we can see are more and more settlements being built and less rights for workers .. we are not the UN nor world government, we want to provide practical support to people under threat. The situation is not fair nor is it equal," he said. "This is a workers' problem and the ITF is a place where we can all understand each other from different positions. We all want the same things, we want a home, dignity and respect. 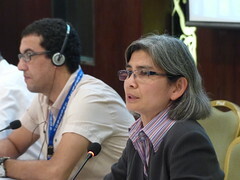 Where workers are struggling we give all the support we can"
Thanking delegates for their support, General Secretary of the PTGWU Nasser Younis responded that ten years of solidarity had brought the ITF here. 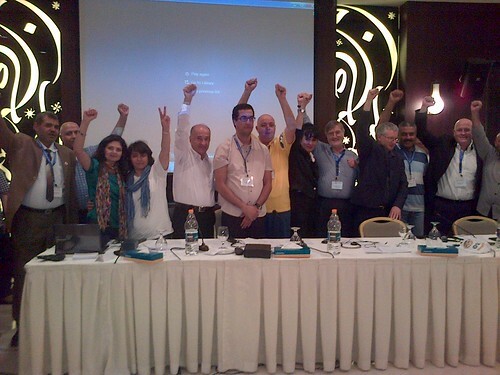 Unions in Palestine had to face up to the darkness with activism. "From one city to another we need hours to travel, this impacts our transport workers. We want to rebuild in Gaza and strengthen our work throughout Palestine," he said. "There will be no dignity whilst Palestine remains occupied, we are in the hearts and minds of all." The resolution passed agreed to support a solidarity fund for a new office in Gaza in cooperation with PGTWU, and agreed the high level ITF mission in 2014. It called on the Israeli government to cease its blockade and to stop discriminating against Palestinian drivers, whilst at the same time demanding that Israeli drivers comply with border crossing rules. It backed transport union unity in Palestine, continuation of the ITF projects and urged all ITF affiliates to support and to use these projects to raise awareness of the cause. 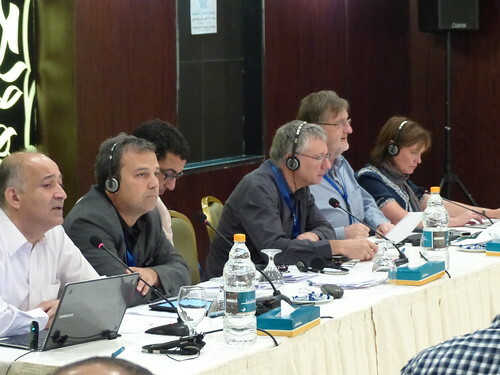 It urged next year's ITF Congress to support an ongoing work programme for strengthening Palestine's unions, for an end to Israeli settlements, for a campaign against the settlements and their products and for the reopening of Gaza's international airport and for a strong trade union response should this not be implemented. Freedom of association in the Gulf States is a regional matter but also a global one. Emirates, Etihad and Qatar Airways are global businesses that avoid costs by denying their largely migrant workforces basic labour rights and freedoms, while other airlines in the region that do recognise unions suffer unfair competition. Emirates is one of three biggest airlines in the world, Last year it grew 15%, it employs more than 30,00 aviation workers. Qatar Airways and Etihad are smaller but growing fast. "We are talking about 70,000 workers without a union to defend their rights in the fastest growing global airlines. We need a good, strong and well planned campaign. The discussion is starting here where these airless base themselves." said Gabriel Mocho, ITF civil aviation secretary. - Present a resolution to the ITF Congress in Bulgaria in August 2014 on this important initiative.